When you buy a ticket to Hansel & Gretel, a new installation by Chinese dissident artist Ai Weiwei, you might not notice the fine print on the back: “Your attendance at this event shall be deemed your consent to have your image or likeness appear in any video display or reproduction in whole or in part.” That’s part of the exhibition’s mystique. You might not even realize you’ve given your consent to be watched or recorded–much like the terms of service agreements we routinely accept every day. Little by little, corporations and the government have whittled away our privacy. Security cameras, traffic cameras, and, increasingly, police body cameras record where we go and what we do in public, and they’re becoming more sophisticated with the introduction of facial recognition software. Social media sites mine our every like and click to create profiles they can then use to target us with ads. While the general public has often met this encroachment on privacy with apathy, some artists are working to highlight just how deeply it impacts our lives. 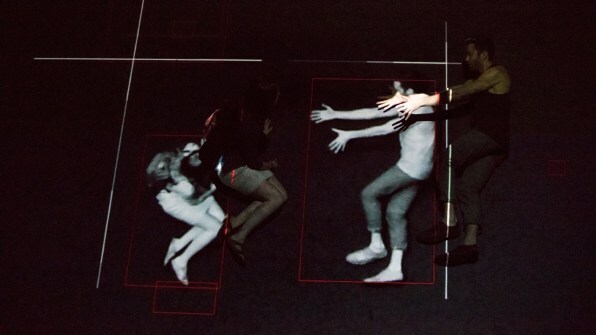 Weiwei’s Hansel & Gretel, created alongside the Swiss architects Jacques Herzog and Pierre de Meuron at the Park Avenue Armory on Manhattan’s Upper East Side, is the latest piece to tackle the effects of constant surveillance with a focus on its impact on public space. “It’s part of our reality as architects and artists,” Weiwei tells Co.Design. “We are all very keen about the human condition. We are very interested in how our lives are interpreted and to see how we act under certain conditions.”The installation is an enormous, interactive environment of voyeurism. Instead of entering the armory from its grand, ceremonial entrance on Park Avenue, you’re funneled through a back entrance and a long, narrow, dim hallway before reaching the Drill Hall, a 55,000-square-foot space with an eight-story-tall ceiling. The cavernous interior is pitch-black and the floor has a slight slope, making it disorienting to explore at first.